David Wolff and David Hightower are driving down the partially completed Grand Parkway around Houston. The vast road, when completed, will add a third freeway loop around this booming, 600-square-mile Texas metropolis. Urban aesthetes on the ocean coasts tend to have a low opinion of the flat Texas landscape—and of Houston, in particular, which they see as a little slice of Hades: a hot, humid, and featureless expanse of flood-prone grassland, punctuated only by drab office towers and suburban tract houses. But Messrs. Wolff and Hightower, major land developers on Houston's outskirts for four decades, have a different outlook. "We may not have all the scenery of a place like California," notes the 73-year-old Mr. Wolff, who is also part owner of the San Francisco Giants. "But growth makes up for a lot of imperfections." A host of newcomers—immigrants and transplants from around the United States—agree. The city's low cost of living and high rate of job growth have made Houston and its surrounding metro region attractive to young families. According to Pitney Bowes,PBI +2.11% Houston will enjoy the highest growth in new households of any major city between 2014 and 2017. A recent U.S. Council of Mayors study predicted that the American urban order will become increasingly Texan, with Houston and Dallas-Fort Worth both growing larger than Chicago by 2050. Houston's economic success over the past 20 years—and, more remarkably, since the Great Recession and the weak national recovery—rivals the performance of any large metropolitan region in the U.S. For nearly a decade and a half, the city has added jobs at a furious pace—more than 600,000 since early 2000, and 263,000 since early 2008. The much more populous greater New York City area has added 103,000 jobs since 2008, and Los Angeles, Chicago, Phoenix, Atlanta and Philadelphia remain well below their 2008 levels in total jobs. Los Angeles and Chicago, like Detroit, have fewer jobs today than they did at the turn of the millennium. Many of Houston's jobs pay well, too. Using Praxis Strategy Group calculations that factor in the cost of living as well as salaries, Houston now has among the highest, if not the highest, standard of living of any large city in the U.S. The average cost-of-living-adjusted salary in Houston is about $75,000, compared with around $50,000 in New York and $46,000 in Los Angeles. Since 2001, the energy industry has been directly responsible for an increase of 67,000 jobs in Houston, and it now employs more than 240,000 people in the area. These include many technical positions, one reason the region now boasts the highest concentration of engineers outside Silicon Valley. The jobs should keep coming: University of Houston economist Bill Gilmer estimates that $25 billion to $40 billion in new petrochemical facilities is on its way to Greater Houston. Houston also has seen a surge in mid-skills jobs (usually requiring a certificate or a two-year degree) in fields such as manufacturing, logistics and construction, as well as energy. Many of these jobs pay more than $100,000 a year. And according to calculations derived from the Bureau of Labor Statistics by the Praxis Strategy Group's Mark Schill, since 2007 Houston has led the 52 major metropolitan areas in creating these jobs, at a rate of 6.6% annually. In contrast, mid-skills jobs have declined by more than 10% in New York, Los Angeles, Chicago, and San Francisco, which have not been friendly to such industries. 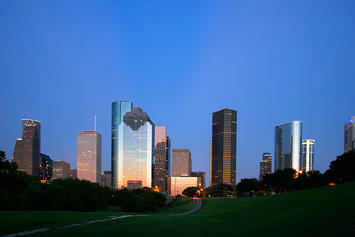 Houston's growth is more than oil-industry luck; it reflects a unique policy environment. The city and its unincorporated areas have no formal zoning, so land use is flexible and can readily meet demand. Getting building permits is simple and quick, with no arbitrary approval boards making development an interminable process. Neighborhoods can protect themselves with voluntary, opt-in deed restrictions or minimum lot sizes. The flexible planning regime is also partly responsible for keeping Houston's housing prices relatively low. On a square-foot basis, according to Knight Frank, a London-based real-estate consultancy, the same amount of money buys almost seven times as much space in Houston as it does in San Francisco and more than four times as much as in New York. Houston has built a new kind of "self-organizing" urban model, notes architect and author Lars Lerup, one that he calls "a creature of the market." Housing-market flexibility has also benefited some of the city's historically neglected areas. The once-depopulating Fifth Ward has seen a surge of new housing—much of it for middle-income African-Americans, attracted by the area's long-standing black cultural vibe and close access to downtown as well as the Texas Medical Center. Rather than worry about gentrification, many locals support the change in fortunes. "In Houston, we don't like the idea of keeping an image of poverty for our neighborhood," explained Rev. Harvey Clemons, chairman of the Fifth Ward Community Redevelopment Corporation. "We welcome renewal." Houston's explosive economic growth has engendered another kind of boom: a human one. Between 2000 and 2013, Greater Houston's population expanded by 35%—while New York, Los Angeles, Boston, Philadelphia, and Chicago grew by 4% to 7%. According to a 2012 Rice University study, Greater Houston is now the most ethnically diverse metro region in America, as measured by the balance between four major groups: African-American, white, Asian and Hispanic. "This place is as diverse as California," notes David Yi, a Korean-American energy trader who moved to Houston from Los Angeles in 2013. "But it is affordable, with good schools." The growth-friendly attitude is what holds everything together in Houston, and it will be crucial whenever the next slowdown comes—when oil prices could drop, say, to below $100 a barrel. It remains to be seen whether a large influx of newcomers to Greater Houston from the ocean coasts will clamor, as they have elsewhere—notably, in Colorado—for a more controlled, high-regulation urban environment. For now, though, most Houstonians see the city as a place that works—for minorities and immigrants, for suburbanites and city dwellers—and few want to fix what isn't broken. This article first appeared in the Wall Street Journal. Tory Gattis is a Social Systems Architect, consultant and entrepreneur with a genuine love of his hometown Houston and its people. He covers a wide range of Houston topics at Houston Strategies - including transportation, transit, quality-of-life, city identity, and development and land-use regulations - and have published numerous Houston Chronicle op-eds on these topics.